I'm not as super optimistic as many people about 2016 and the Cubs. I do believe the Cubs will have a winning year in 2016. I believe that acquiring Heyward is a very positive aspect for the Cubs. In fact, I'm a big fan of his defense and office. So yes, I am very excited about the Cubs acquiring him. I believe there is a lot more greatness to come from him. I think it speaks loads in his faith in the team also by choosing the Cubs for less money because he believes he has the best chance of winning a World Series with the Cubs. I know that the management and owners are working hard on improving pitching, I'm not convinced the changes so far will make a big difference. Will Jake Arrieta have another outstanding year? Also, I'm not so excited about John Lackey. We saw the best of him early on in 2015 and the Cardinals know that he has already peaked. The Cubs will get Lackey on his way down. Hopefully he can give the Cubs some good innings. Although each year Anthony Rizzo improves, I would like to see a more consistent Rizzo. I love many amber beers, so I decided to try a new one for #4 of 100. Found this one on an end cap at a local grocery store. Rating: Good, not great. Rich taste. For me, taste better cool, than cold, like standard American lagers. - Now accepts StartFunction and InitFunction for startup. 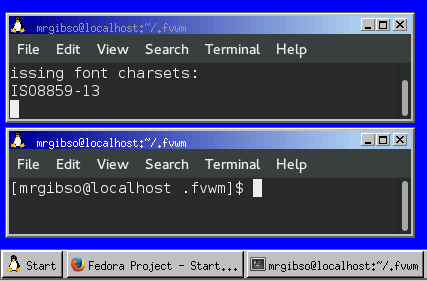 - Replaces the Mozilla link and adds a FireFox link to the menu system. - Added a GIMP link to the menu system. The general look and feel remains the same. 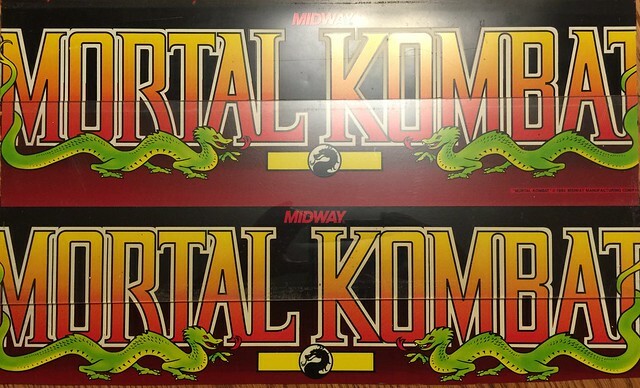 Photo of my two original Mortal Combat arcade marqueues. Sammy Adams on a Sat night. I did an experiment today with Samuel Adam's Boston Lager. I drank half of the beer at room temperature and the other half refrigerated. The room temperature lager was sweeter and richer. The cold lager was sharp and bitter. Most people I know drink Samuel Adam's cold, but this is not the first beer I have tried that tasted better to me 'warm'. For my second beer, I grabed a beer that I have only seen/noticed at one store in town (sold exclusively at Hy-Vee stores). I'm going to try something new. 100 different beers by the end of Next November. This is something I have always wanted to do. So I have purchased some beers I have never tried. First, one to try is Twisted Pretzel. Rating: Two thumbs up! Unusual, but loved the taste. To bad it is a limited brew. I love dual photo baseball Cards. Most of the two photo sets anyway. Unfortunately, not all cards in this small category are of the same quality. In fact, designs could vary greatly in a small period of time. 1956 was Topps first spectacular card set. In my opinion, the first perfected 2 photo based card. Each card had a large foreground portrait and a background action shot. Topps 1989 "Big" cards are the reincarnation of Topps 1956 cards without the softness or awesome actions scenes. None the less, this is a very attractive set. The colors in this set can be described as very attractive and vibrate. The quality of this set is due to the competition from Bowman card company. This is the first dual photo set card series by Topps. Fleer knows what upper class cards look like. This is card style that the Topps 1983 cards were modeled off of and improved from. #11 Topps 1990 "Big" set. 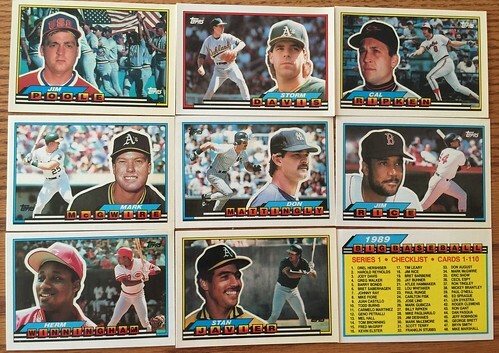 For all that Topps did right for the 1989 Topps Big cards, they lost their way with 1990. I'm not surprised this was the second and last "Big" year. I admit Topps 1961 is not the worst set ever made, but it is on the bottom of this list. I'm just posting a quick note. You may have noticed many changes on this web site. I'm in a coding fenzy agian trying to make the site a better experience. If you have or see any problems please let me know. This will probably go on for another week or so. - The blog and posting system again. - The code for the RSS. - Improvements for the baseball card database interfaces. - Adding a trial video database. - Make the Web and RSS portion compatible with Apple products. Ok. I'm a little upset with Topps. OK. This is a little bit of a rant. 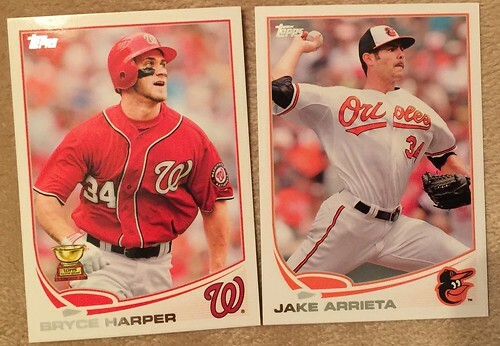 I have patiently been waiting on the Topps 2015 update. Why? For three players; Kyle Schwarber, Addision Russell, and Kris Bryant. I wanted to have a chance to complete my Cubs set for this year. Despite Bryant breaking multiple Cubs batting records, Kyle is the better bat of the three rookies. Everyone knows that Kyle made his debut in June of 2015 (in a big way), yet Topps left him out. "So what", you might say. Wells, normally May and June rookie debuts will make the Update set. Even for mediocre rookies. I'm not the only person miffed by this, tons of comments all over the internet about this. I have yet to hear from Topps why they chose not to include Kyle. 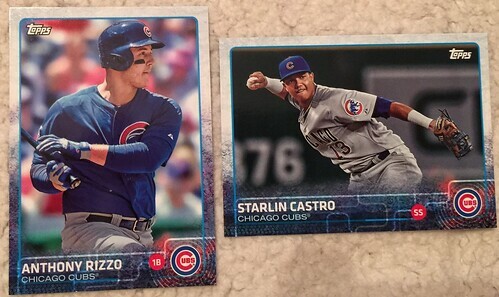 Some have suggested that leaving out Schwarber, Sano and Severino was to give the 2016 Series 1 cards a major boost. On the subject of Topps 2016 cards. Two Boston Red Sox friends who moved on to other teams. Now facing off in game one of the NLDS series. Don't have a Cardinal card of Lackey. In Fact, I only own two cards, one each of these two players. 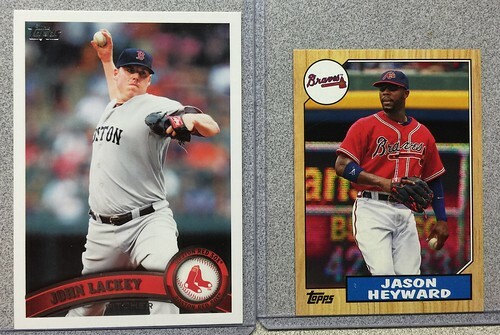 Here are two Topps 2013 Future HoFer cards. 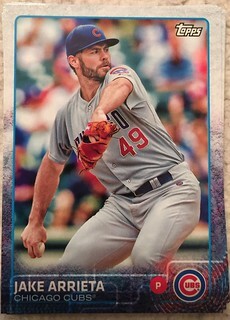 Oct 2015, one can't post too many Jake Arrieta cards. Even Jake with a funny little stache. Wow! What a season. Cubs end the regular season 32 games over 500 with a record of 97 wins 65 losses (.599) and 3 games behind the Cardinals. So far with the Cubs, we are looking at a Hall of Famer. I will keep the post updated till the end of the season. Should I write about how good a pitcher Bill Hands was? Nah. He was good, but how about Lee Smith? No I don`t want to write about another relief pitcher at the moment - although he was really good. How about Orval Overal? Sigh, really good, but no. Oh, Oh, I know! Carlos Zambrano! Yeah, I'm going to go with this controverial pitcher :) He is someone worth writing about. Carlos played for the Cubs between 2001 and 2011. Cub Fans either hated him...... or loved him. Some fans did both. But I can make a case that he belongs on the list of one of the best Cubs pitchers. First of all, when he was hot, he could get strike outs. Carlos is one of the few Cubs in modern history to have a no hitter/full game shutout. 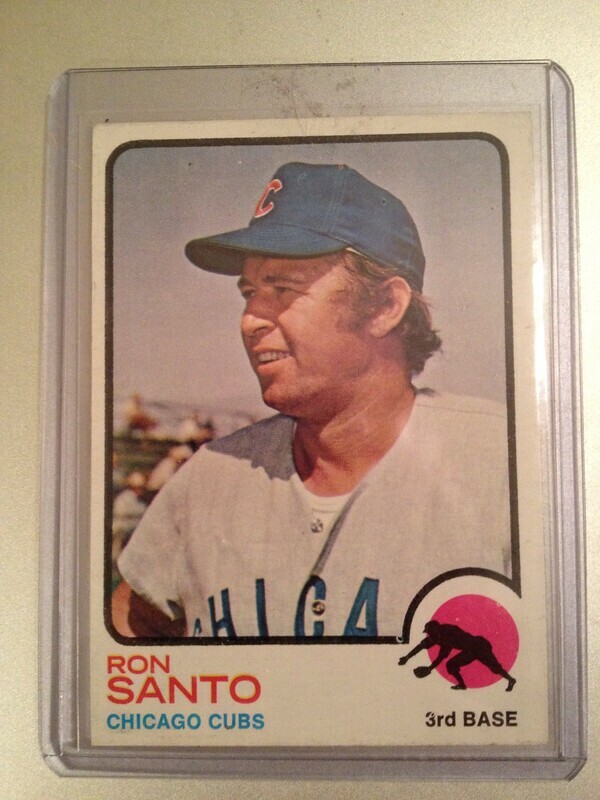 He was a three time All-Star with Cubs. Considered for Cy Young three times. Three time Silver slugger with Cubs. Two years with over 200 strikeouts. Lastly, a temper. The worst part about Big Z - If the catcher/manager could keep Carlos focused, he was an Ace. Get him flustered, he fell apart. - 2nd in Career with Cubs in strikeouts with 1542 in 1826.2 innings pitched. - 9th in Career with Cubs WAR leaders with 37.9 in 1826.2 innings pitched. - 9th in Career with Cubs Strikeouts per 9 innings pitched with 7.597 in 1826.2 innings pitched. 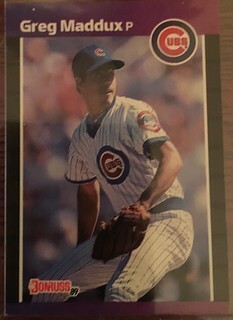 With so many good Cubs pitchers left to choose from for post number 8, I have decided to go with a pitcher that amazed me with a ball that magically disappeared from the batter. His name, Kerry wood. His first 6 years, he was amazing to watch. His rookie year, he struck out 20 batters in one game, had a season 233 strikeouts and averaged 12.6 strike out every 9 innings. That won him the Rookie of the year award. Why I debated about not posting about Kerry Wood is the fact that he was accused of, but never tested positive of doing steroids. There were posts that popped up on the web that Kerry was on a long list of players that were on steroids in the George Mitchell Report. It was latter shown false that he was on the list and this info retracted on some sites, but remained on other sites. Unfortunately, Kerry will probably never see the Hall of Fame because of these rumors and speculation. Kerry played most of his career between 1998 and 2012. If he does make it to the Hall of Fame, it will be for his ability to strike out batters both as a starting, reliever, and a closing pitcher. The bold stats are his 6 outstanding years with the Cubs. - has the 1st (12.582), 2nd (11.346), and 4th (11.203) best seasons for strikeouts per nine innings. - 3rd overall in Cubs career 10.34 strikeouts per 9 innings with 1279 innings pitched. - 3rd overall in Cubs career strike outs with total fo 1470 over 1279 innings pitched. - First and deservingly, he is a member of the Hall of Fame. - He is a 4 consecutive time Cy Young award winner. - additionally a 17 time Golden Glove winner. - Best WHIP 4 different seasons. - Most wins 3 different seasons. - A career 355 wins. - A career 3,371 strike outs. - 10th for single season WAR (1992). - 21st in Cubs total shutouts. - below 50th for ERA in single season. - below 50th for ERA with Cubs. In areas not mentioned, he does not rank in the Top 50. The year 1992 was his only great year with the Cubs where he ranked in anything with the Cubs. The Braves used him for his other 7 great years. When continued on his decline the following years, he went back to the Cubs in 2004. For my sixth post on great Cubs pitchers, I chose Rick Sutcliffe. Rick was at times a very impressive pitcher, but not consistant enough to be a hall-of-famer. That said, he was impressive enough to make my list for various reasons. 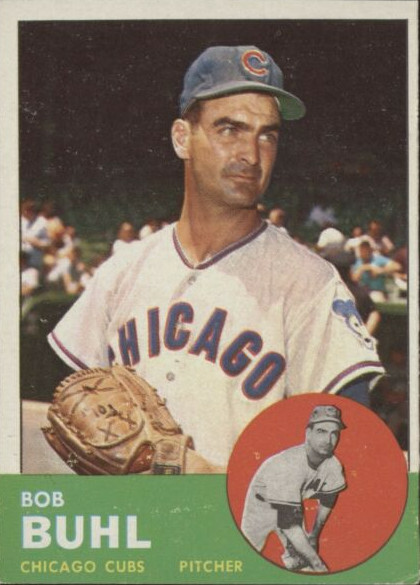 Overall, he ranks much lower than the other 5 pitchers that I have mentioned in my previous posts, but he was a major contribitor in his years with the Cubs. Rick played with the Cubs between 1984 and 1991. He had three really impressive and outstanding years with the Cubs, but he also had 6 average years with the Cubs. 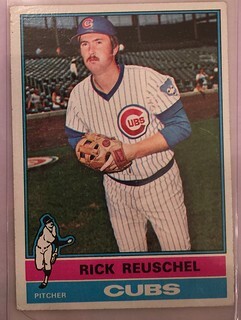 Rick's career highlights include the fact that he was the Rookie of the Year in 1981, Cy Young winner as a Cubbie in 1984, and a 3 time All-Star (2 of these with the Cubs). His best season was his first season with the Cubs in 1984. That season he won the Cy Young with 20 (.769 total /.941 w Cubs) wins with 213 strike outs. .941 is the best win-loss percentage ever by a Cub pitcher. Unfortunetly, he would not have an outstanding year again until 1987 with 18 (.643) wins and 174 strike outs. That year he made the All-Star team and came in second in votes for Cy Young. Rick then had a good year again in 1989 with 16 wins and 153 strikeouts and All-Star team. 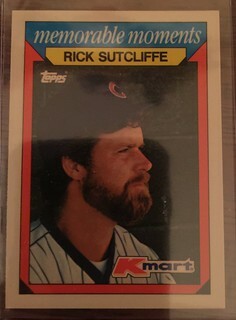 Here is my entire collection of Rick Sutcliffe. 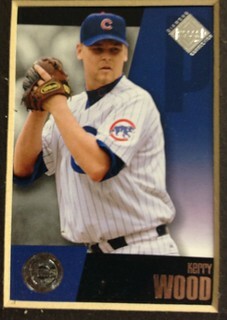 - 2nd with a career 48.3 WAR in 2290 innings pitched with the Cubs. - 2nd with Cubs in 343 games started. - 6th with inning pitched (2290) as a Cubbie. In Rick's career, he was nominated three times for the Cy Young award. 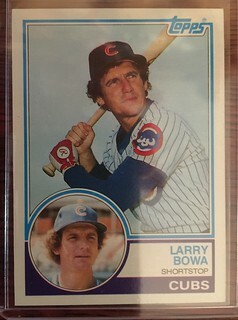 His best chance as a Cubbie was in 1977. That year he had 20 (.667) wins, 4 complete shut outs, the highest WAR of the candidates (9.4), struck out 166 batters, only gave up 13 HRs, and selected to the All-Star team. Unfortunately Steve Carlton won that year with 23 wins, 5.9 WAR, 2 shut out games, 198 strike outs, giving up 25 home runs. 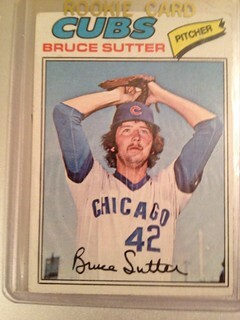 The next great Cubs pitcher I'm posting about is Bruce Sutter. Like 2 of the 3 others I have posted, he is a Hall of Fame pitcher. Unlike the other 3 pitchers mentioned in this series, he was a relief pitcher. Besides being a HoFer athlete, he also has been an All-Star 6 times (4 times as a Cubbie), awarded the Cy Young (as a Cubbie), and led the Major League Baseball in Saves 5 different seasons. In fact, he had 21 or more Saves 9 seasons in a row of his 12 seasons for a career of 300 Saves. 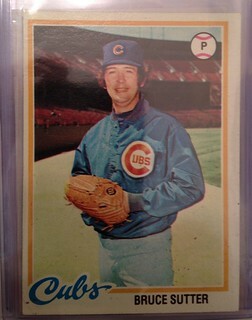 His best year with the Cubs was 1977, when he had 37 saves and a 0.977 WHIP. That year he was nominated for MVP, won the Cy Young award, and made the All-Star team. Here is the listing of what I have of Bruce in my Collection. I have a lot of great Cubs pitchers to cover, but Fergie Jenkins felt like the next logical choice to cover. Fergie also a Hall of Fame pitcher and a Cy Young award winner, is one of only four pitchers in major league history to record more than 3,000 strikeouts with fewer than 1,000 walks. He started with the Phillies and for a period played for the Rangers and Red Sox. Fergie's last year with the Cubs was 1983. During the 70's and 80's, I was still a die hard Cardinals fan and still not really giving the Cubs much attention, so I'm sad I never made a point to watch him pitch as a kid. Over 19 seasons, He had 284 wins and 3192 strike outs. Here is the listing of what I have of Fergie in my Collection. This is post number 2 of the best Cubs pitchers of all time. I have posted my Mordecai '3 fingers' Brown card on this blog before in 2012. He played for the Cubs from 1904 and up to 1912. 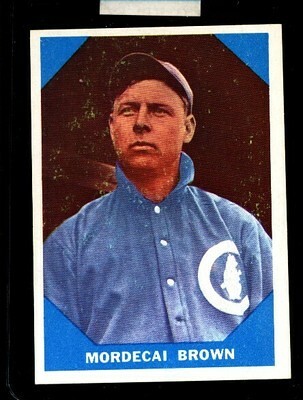 Brown was part of the best Cubs team of all time (he played on the Chicago Cubs championship teams of 1906, 1907, 1908 and 1910) and was elected as a Hall of Fame player. He lost his index finger as a child on farm equipment, thus earning his nickname '3 fingers Brown' and adding the ability to spin amazing movement on the ball. Here is my 1960 Fleer Mordecai '3 fingers' Brown card. By any standards and any era, these numbers are remarkable. Over 14 seasons, he had 239 wins, with a 2.06 ERA, 1375 strikeouts, and 55 shutouts. His 2.06 ERA is the best in MLB history for any pitcher with more than 200 wins. - In the 1906 World Series Game 2, Ed only gave up one hit, a seventh-inning single to George Rohe. - His best year was 1908, when he won 24 games for the National League and World Series champion Cubs. - He pitched two shutouts in one day against the Brooklyn Dodgers on September 26, 1908. No other pitcher has ever accomplished this feat in the major leagues since. Koufax, who also pitched in a pitching-oriented era, Reulbach never received a single vote for the Hall of Fame." Why did Ed get completely overlooked for the HoF? Many say because of how is number compared to his HoF team-mate Mordecai "three fingers" Brown (who I'm posting about next). I collected 1980s Leaf/Donruss baseball cards fairly heavily during the 80s. 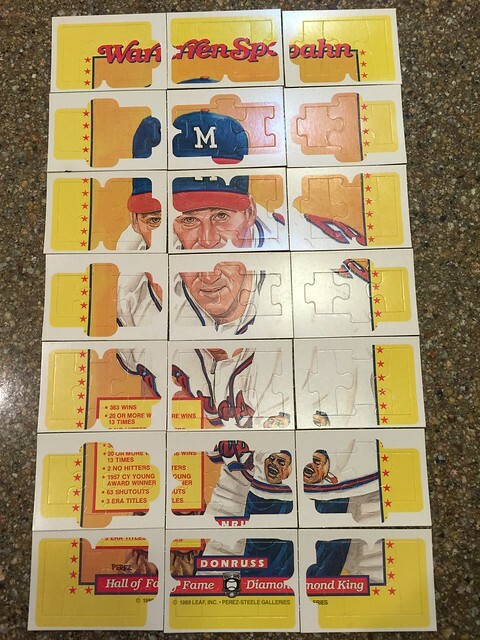 With the cards came puzzle pieces - 1 puzzle piece card per pack. For the first time, many years later, I actually took the time to place-together one of the puzzles. And now I can share :) Looked at the other puzzles and this is the only puzzle I was able to complete from Leaf/Donruss. 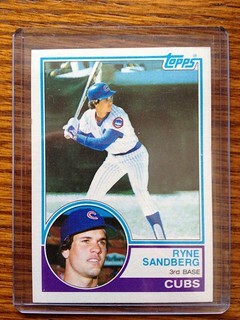 In my child hood, for some odd reason (that I can`t remember in my old age), I never purchased any Topps 1983 cards. In fact, I checked out of collecting in 1983 and 1984. When 1985 rolled around, I was collecting again. So now I am piecing the set together a dime, quarter, and dollar at a time when I see them. Yes, I`m an adult with a fascination of something I did not have as a 13/14 year old. But the funny thing is that I always loved the look of these cards. 1983 Topps Rookie Ryne Sandberg and Larry Bowa card. 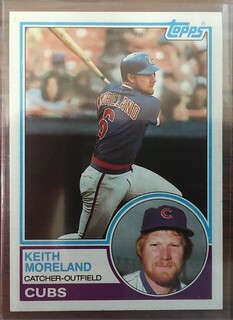 Additionally, here is my Keith Moreland card. 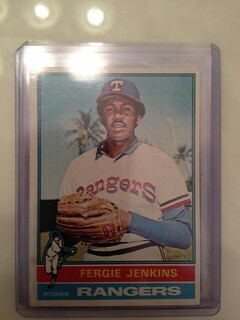 I also have Fergie Jenkins and Doug Bird cards for 1983 Topps. 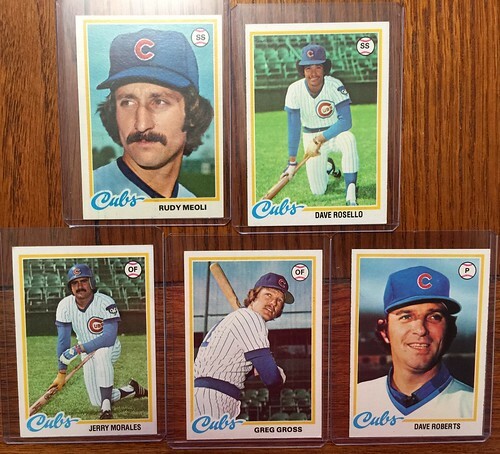 My 1983 Chicago Cubs list is here. Also my collection of Ryne Sandberg, Fergie Jenkins, Larry Bowa, and Keith Moreland cards. Belonging in the short list of Hall of Famer Cubs, statistically, Ernie Banks is the 8th best overall offensive batter (for career Cub players) that the Cubs have ever had. Ernie had 2,583 MLB career hits and 512 MLB home runs. Season high hits was 193. Season high home runs was 47. In fact, he had five season that he had over 40 home runs. Ernie was also a 11 time All-Star. He had season batting averages of over 300 - three different seasons. Over 100 runs-batted-in - 8 different seasons. This is why I had to have his cards in my collection. Additionally, I admired him as a person, not just a great ball player. This is my 1964 Topps Ernie Banks. This card is not in great condition, but one of my favorite. 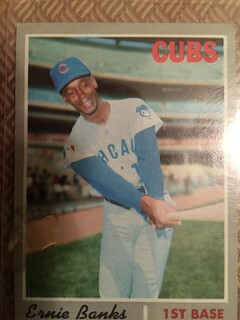 This is my 1970 Topps Ernie Banks. 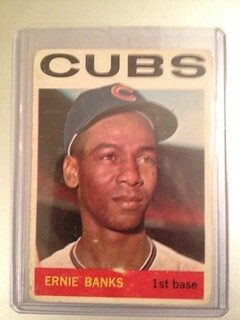 To see what I have of Ernie Banks, you can search my collection here. Here is to Mr Cubs. From my over 10K cards, I am sooo far from recording all the cards from any of my sets. I look at all the cards I have yet to record and feel overwhelmed. Except for one set that is, my 1986 Topps set. That set has been completely recorded. 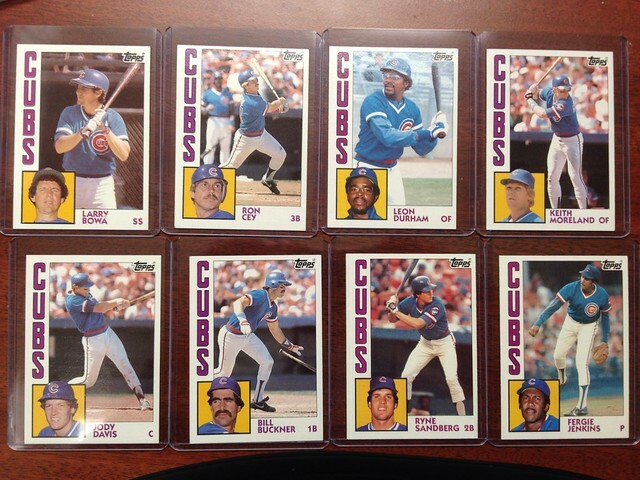 But you may say, "Mike, there are only 7 cards recorded for 1986 Topps". Yes, that is correct. I once had many, many 1987 Topps cards. Now I have seven. Worse is that I have no idea where they are or when I lost them all. It is not like I ever stored any of my cards separately, but somehow they have been separated from me. I'm also missing some 1985 cards, but not as many as the 1986 cards. My best guess is they were lost in one of my many moves throughout the years. Another thing that amazes me is that I never realized how many Fleer cards I have. 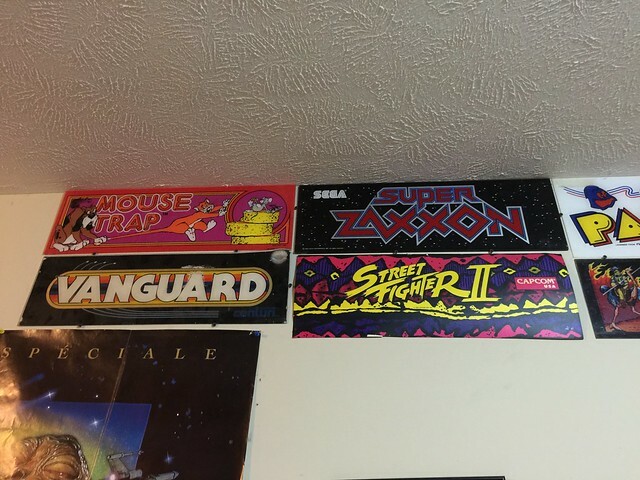 Throughout the years, and at different times, I have had different favorite brands. But overall, I would have to say I preferred Fleer. The numbers currently recorded do not reflect what currently have, but I have many more Fleer cards to record. 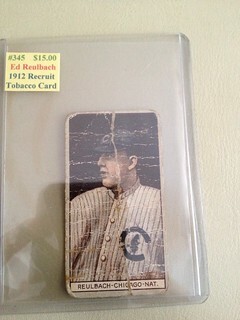 Lastly, I finally found a particular player that I have been looking for in my collection. A player that August and I had done a lot of reading on and reflecting on - Jim Abbott. He was a one handed baseball player that experienced not only skills to become a MLB player, but success as one. Last night I pulled out the entire baseball card collection to organize and to do a visual count of the collection. This was not my normal cataloging and recording routine. What I found out is that I have considerable more cards than I had realized. In fact, I have more than 10,000 cards, mostly between the years of 1985 and 1991. 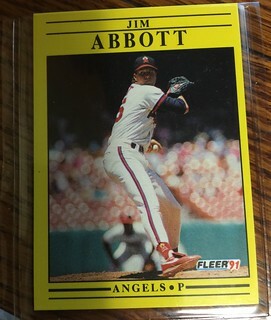 These years are the years in which baseball card collecting was in it's highest level of popularity, with many, many, sets to choose from and I was buying this over-produced stuff like everyone else. What this means, sadly for me, is not only am I not half way done recording what I have in my colection; I'm even further away to my goal of getting all my cards cataloged. In the time being, I'm going to focus on 1987 and 1988 Topps cards. One of my favorite hobbies is crunching baseball player stats. So sometimes I look at baseball cards to find those forgotten players. I do this for historical curisosity and entertainment reasons. I learn so much about baseball doing this and all the players from the 1800s to present day players. I stumbled on a modern day player named Rudy Meoli. He played for the Cubs for only one season. Looking at his stats, he was ranking from all my compiled data as possibly the worst Cubs player to have played for the team. Then I stumbled on this article. You can find his Cubs hitting placement here. 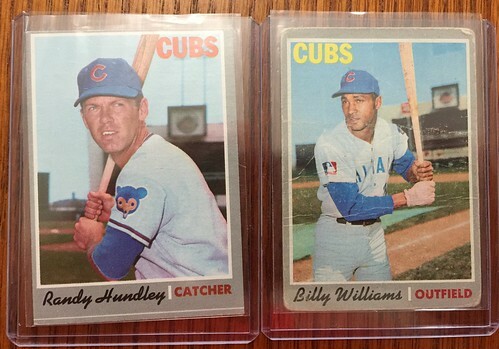 I'm so excited about the fact that tonight I purchased two Billy Williams baseball cards. Billy is in the Hall of Fame for a career that had a total of 1410 hits, 2711 runs, 434 doubles, 88 triples, 426 home runs, and 1475 RBIs. He received the Rookie of the Year award in 1961. He made the All-Star team 6 times. He had more than 200 hits in three different seasons. He also had more than 100 RBI for three seasons. Impressively, Billy knocked in 42 home runs in 1972. When the new cards arrive, I will proudly post better images of them. 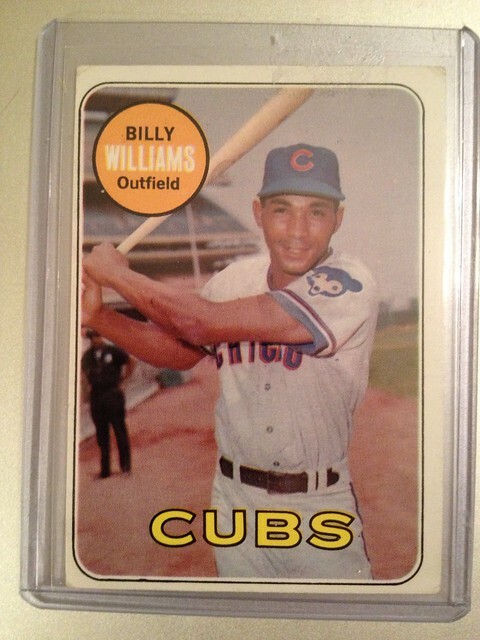 To see what I have of Billy Williams, you can search my collection here. I'm approaching the point of half of my baseball card collection being cataloged and organized. Progress can be viewed on http://mrgibson.com/baseball1.php. This process has taken quite a while. I have been at it off and on since 2012. To stand over the collection, one can physically see there is a whole lot more to do. That said, I believe the process has been quite beneficial as a collector. It has allowed me to enjoy my cards, know more precisely what I have (even the ones I have not cataloged), and know exactly where the cataloged cards are kept. This way, if I wish to view, sell, trade, or display any card, it will take much less of my time searching. The card storage container and order in the container is stored in the database. So all of that said, I ask myself, can I complete this project? I may sell or trade off many of the 1989 - 1991 cards because I have completed some of these sets and have so many duplicate cards in those years. I think I have been more successful with this when I have paced myself also. So I think the answer is yes, but not sure how long it will take. Q. Why are cubs fans best to date? A. They aren't expecting a ring. Q: Whats the difference between the Chicago Cubs and a mosquito? Q: What's the difference between dirt and the Chicago Cubs? Q: What did Jesus say to the Chicago Cubs last time he was on Earth? A: Don't do anything till I get back. Q: What does a gay bear and October have in common? Q: What do you call a Chicago Cubs player with a World Series ring? Q: What they call winning teams in Chicago? ....but will anyone notice. [brushes off cobwebs] I had broken much of the code to make the blog unusable. Now I'm trying to fix the code (much had been deleted).